First Line: Through the slit in the closed drapes, a thin bar of afternoon sunlight fell across the soldier's chest, highlighting the dark, small bullet hole. Captain Elizabeth "Pepper" Pepperhawk has returned from her tour in Vietnam to serve as head nurse at an army hospital in Fort Bragg, North Carolina. Since she's shown up early, she takes a room in a building for visiting military personnel. Given the key, she goes to the room, unlocks the door, walks in... and discovers the dead body of a soldier on the bed. Not an auspicious beginning to her new life stateside. Through the ensuing investigation Pepper meets military police Captain Avivah Rosen, who-- more than anything-- wants to serve in Vietnam. With the help of Green Beret Benny Kirkpatrick, the two women discover that Womack Army Hospital has more than its share of secrets-- secrets that someone is willing to kill to keep buried. 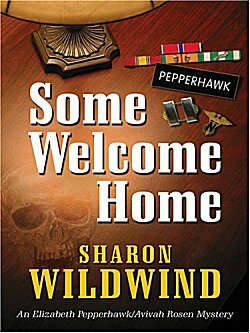 Author Sharon Wildwind is a former Army nurse who served in Vietnam as well as Fort Bragg. She's writing what she knows, and that knowledge glows on the page. Some Welcome Home does an excellent job of showing military personnel adjusting to life stateside, and it also takes a good look inside the military police, nursing, and the prevailing attitude in 1971 toward women in the military. Besides that insider knowledge, another strength of this book is its three main characters. Pepper is a good nurse, but doubts herself too much and has a tendency to sink into a bottle if things go wrong. Benny has fallen in love with a woman whose husband is missing in action. Avivah is one sharp investigator and a good soldier; however, her repeated requests to serve in Vietnam are always turned down. Wildwind's mystery is excellent and extremely difficult to solve. If I found any weakness at all in this book it was in the action scenes. They weren't quite up to the standard of the rest of the book; however, that's a small complaint. The setting, the characters, and the story all make me want to read the next book in the series as quickly as possible. I think this context is interesting, Cathy. For whatever reason, I don't see a lot of Vietnam-Era novels with this sort of theme. And it's good to know that there's a set of solid characters here. The context is one of the major things that drew me to this mystery, Margot, and I'm glad it did.